If you're like my sister, you probably saw the title of this post and thought "bleh"; read on though, I promise you this recipe is worth trying. It's healthy, tasty, and easy to make. Preheat the oven to 450 degrees. Cover two baking sheets with parchment paper and spray with oil. Cut eggplant in half lengthwise. Cut each half into 1/4 inch thick slices. Try to keep all sizes relatively similar sizes so that they will cook evenly. (The bf didn't do such a great job of the cutting here). In a bowl, season the eggplant strips with olive oil, salt and pepper. In another bowl, combine the parmesan cheese, breadcrumbs and garlic salt. Put the egg whites in a separate bowl. 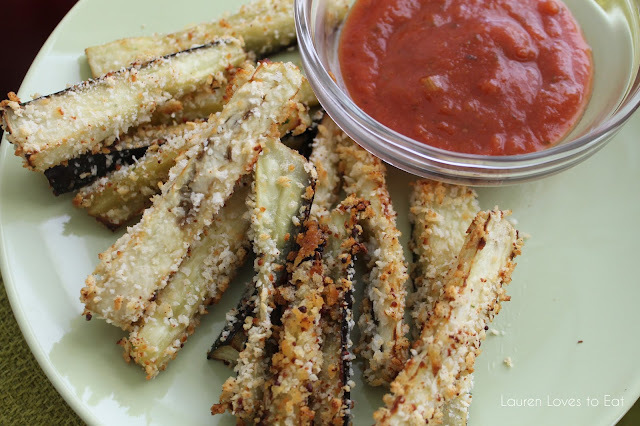 Dip the eggplant sticks into the egg whites, and then into the breadcrumbs. I found that it was too messy with breadcrumbs clumping together when trying to do more than one at a time. Dipping individually, it's easier to shake off the crumbs and get a nice thin coat to stick before placing onto the baking sheets. What a tasty way to eat eggplant!